Awarding the prestigious Gold award in the sought-after Best Large Lettings Agency for the third year running, the judges stated that: "Foxtons is an amazing agency which is head and shoulders above its competitors. 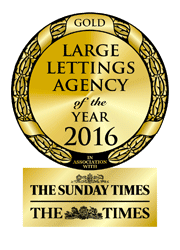 As a long-standing player in the lettings market, the continued evolution of the business is impressive". Ed Phillips, Managing Director for Lettings at Foxtons, commented that "this fantastic achievement would not have been possible without the incredible work and dedication of everyone across the company, who work together to continuously provide exceptional service and results."